Almeria airport, code LEI and phone number (34) 950 213 715 00, like all most airports, is located right outside the centre city, about 10 kilomteres to the east with easy entrance by using the coastal road N340. Even though the airport in Almeria is not an international one, it is well kept and serviced due to the fact that there is a high volume of tourist coming daily, especially from the united Kingdom and northern Europe.There are loads of cheap flight combinations via Madrid or Barcelona. With this intense traffic of travellers, this Costa del Sol airport has installed and carefully adopted the necessary services for its customers, making Almeria airport a very useful one. Usually when arriving at an airport, other than assuring the safe arrival of our baggage, we are then worried about how to get to the city, or if we are headed to a nearby vacation area, the quickest way to do it. 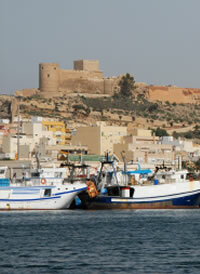 With the excellent airport transfers from Almeria airport, we can leave those worries behind. 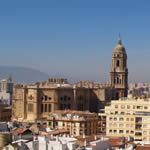 If you have wisely chosen to rent a car at the airport, the infinitive Almeria car hire will tend to your every whim. If you are just going a short distance, then there are local buses which commute to and from the airport, transferring passengers to nearby towns and the city every half hour starting at 7 a.m. and finishing its last journey at 9 p.m. If using local bus transport within the city, keep in mind that exact change is usually required or at least small change is asked for. As soon as you board the bus, you can find a sign to the left of the bus driver which tells you how much it will cost. If you are going to be moving about and using this type of transport, it would be adviseable to get a pass called a ´bono´ for 10 trips, a lot cheaper and easier to manage. Do not be afraid to flag down the bus even though you are standing at the bus stop and remember that smoking is not allowed on any public transport. When taking a taxi as airport transfer from Almeria airport to any destination, you can queue up as you leave the terminal and you will see that the taxis show an extra square license with two capital letters of SP which means government permitted Public Service. If they are taking you to and from the airport or to any other longer distance trip, they will charge you for luggage and mileage, so be sure to inquire if not certain. All taxis have price metres and are strictly controlled by the authorities. An unoccupied taxi has a green light lit up on its roof. The Almeria airport is a good starting point in anyone´s itinerary to begin to explore this impressive multiform scenery, varying from desert mountain ranges to beautiful hidden coves. 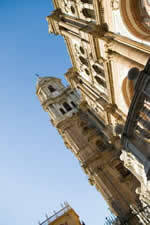 Free Spain Travel and Sightseeing Tips!